Well it has been much too long since I’ve posted a blog, and it’s been a longer than normal several months for me as well! Does that ever happen in your life? Time just seems to stand still and fast forward all at the same time – no doubt that’s a sign of age, and I suppose approaching that ‘half a century mark’ gives me a bit of an excuse for a blip in my blog posts. Life is just a big old box of chocolates as old Gump’s Mom would say, of late it’s been mostly those tart cherry filled chocolates that I don’t much like! One after another seems to come my way some days, and those nasty ones that you can’t even identify what’s actually in the middle, they really make me cringe! Yuck, just what is supposed to be likeable about some of those confections? I much prefer nut-filled chocolates, identifiable nuts (gee, if only humans were!) -- a good solid crunch to accompany my enjoyment of chocolate. And I like the events of life to be a good solid crunch, things I can identify and enjoy, rather than chew on a while and decide to just spit out. Some of life we need to spit out and go on down the road – it’s just a bit hard to recognize those times and we chew too long, while with unacceptable chocolate confections we make the decision just real quick, a few chews and we’re done if it’s just not satisfying those taste and texture buds – it’s one big YUCK. I sold a bull recently to some folks and they came by and picked him up, which was a good thing, I’m always happy when one of my bulls finds a forever home. But what struck me most, was the lady buying the bull recognized my ‘Old 18’ cow at pasture, she had read my blog about her from last October and guessed correctly that she was Old 18. 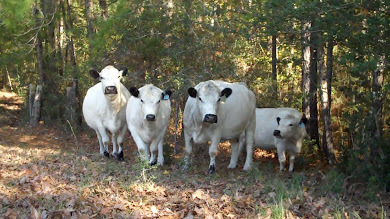 Old 18 has shuffled along this past year with no complaints about finding herself sometimes alone, sometimes with young heifers, or young bulls, and both young groups seem to irritate her at times, and sometimes she’s with the whole herd. Trying to rotate pastures and keep this old girl happy and close by creates times when most anything can happen. When she was first with the large bull crop of calves at weaning this fall, she actually seemed to enjoy that. There were two bull calves that were often found resting right at her side, enjoying the comfort of her age and gender, I have no doubt. 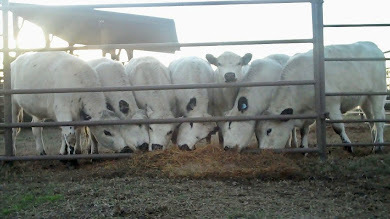 I could tell Old 18 liked being needed by these weanling bulls, and that was a good period for her and me. Yesterday, winter set in and left a calling card. We had probably 5 inches plus of snow, which is quite unusual for deep East Texas. The last time I remember a snow that actually stuck and was significant was 1973, I was in junior high in Woodville, Texas about 10 miles south of where I now live. Regardless of the weather, Old 18 had it all worked out – she had been fed her special ration; she was tucked up in the shed by the big barn here close to the house. But, I put a kink in all that inadvertently. Last night the main cow herd was fairly vocal about this weird snow falling, and I, in sympathy and worry, opened up a gate and let them come on here to the pasture by the house, which also happens to be where Old 18 is always hobbling around. These much stronger, more agile, cows very quickly usurped Old 18’s position under the shelter of the lean-to shed of the big barn. At about 10PM yesterday evening I checked everyone – as in, I buzzed around in my coveralls in the Ranger trying to see them all, and the windshield was clogging with snow, and I was afraid I could even run over a sleeping calf the evening was so blurry -- so it was a new check-on-the-cows experience. But, I did find Old 18 all the way down the hill with a small group of cows and couldn’t imagine that she would have gone so far from the shelter of the shed, or the wind break of the barn. This morning Old 18 is not moving so well – she’s as stiff and slow as I’ve ever seen her. And yes I can understand that the colder weather likely has her stiffer and in more pain with her hip, but I think it’s more, and I think I see her faltering much more when she walks. Last night was a trial for her I have no doubt, and she’s appreciated all day every special thing brought to just her to eat, and she’s appreciated having the shed by the barn all to herself again to get out of the cold wind. But, nonetheless, this evening she was all the way to the fence line where I moved the main herd, sitting down and looking toward them, and I imagine wishing she was with them. I don’t know anymore whether how I handle her age and infirmities is the best approach, the happiest approach, for her – maybe no one does as most old cows are sent to an auction barn. But, I think again of our elderly human loved ones that are in poor health, as I recalled last October when I spoke of Old 18, and I again wonder at our care of an elderly cow, or an elderly dog, or even a new young pup – in comparison to some folks’ care of their elderly and infirm human family. Without a doubt, my Old 18 enjoys her time with the herd, and maybe even wishes she was with them regularly, she probably does – but her hip wouldn’t have survived all the walking and tussling that goes on regularly. Would she have cared? Does she care? Would she just rather be always with her peers no matter the trials of each day? I will never know – because I can’t ask her, I can only watch her and try to figure out what she needs from day to day. But, we can ask our human family what they need, what they want, what makes them happy. And we should ask and listen with real sincerity, and we should try to make that answer happen if we can, or do the best we can in that direction. I imagine if Old 18 could talk, and listen, she would likely understand why she can’t be with the main herd all the time, that doesn’t mean she won’t sit at the fence and watch them and wish she was with them. Too many elderly humans in this world are unappreciated by their children, are not respected for the trials of life they’ve endured to reach that elderly age of Old 18. That is a sad thing to get our heart and mind around, when you watch simple cows and their need and wish for companionship and attention from both their human caretakers and their herd peers, and the absolutely unrelated babes that find comfort with them -- babes that want only their company -- not some empty emotionless benefice from the elderly cow when it leaves this world for the next. The understanding of the instinct for comfort and love seems quickly lost in humans when their elderly become fragile, as though their higher power of intellect gets in the way of the basics of the mammal’s instinct for family and protectiveness, this higher intellect leaves us with a human more like a cow from a breed that has little trust, runs from you, and hogs the trough – not that any cow wouldn’t hog the trough given the chance. But, hey, humans are supposed to be of a higher intellect? Why is it that this base instinct of a cow to hog the trough, to not give a care about whether the cow next to them is their Mom or not, or their sister, just hogging up all the food they can becomes paramount, becomes so often today the higher power of humans? What does it say about them? About us? I really like my cows, they are a fine bunch of girls, and it’s really cool when I see daughters long since weaned hanging out in the pasture with their Mom’s…….. 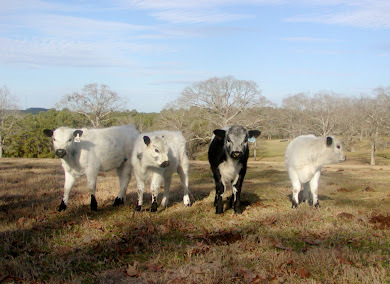 The unique markings of the polled British White, those eye-catching black ears and contrasting pure white coat, are found in a few other breeds of great antiquity around the globe. I have long been fascinated by the global reach of these markings and their antiquity. It seems to me there is a hint of a story, a long and fascinating one, in the wide-ranging presence of these markings and the absolute reverence that is held for the cattle. One of those breeds is the Blanco Orejinegro (BON), and this very special Colombian breed has a strong future now with the Bridel cattle farm in the Cauca Valley of Colombia, which is dedicated to the preservation of this native Colombian breed. According to Jacques Diouf in August of 2007, ". . .the Blanco Orejinegro cattle breed, known for its longevity, tolerance to high altitudes, and resistance to parasites, is under threat; only 260 animals of this breed remain." "BON is peculiar in that it lacks the most common T3 sequence seen in European cattle and in all the other criollo breeds (cattle breeds of Latin America) examined (Col1). Furthermore, five of the six T3 lineages observed in BON are unique to this breed, including the only sequences with transversions. The genetic distinctness of BON is also manifest in the PCA of CR sequence frequency . At the phenotypic level BON is unique among the breeds examined in having a white coat and black ears (Blanco Orejinegro means "white with black ears")." 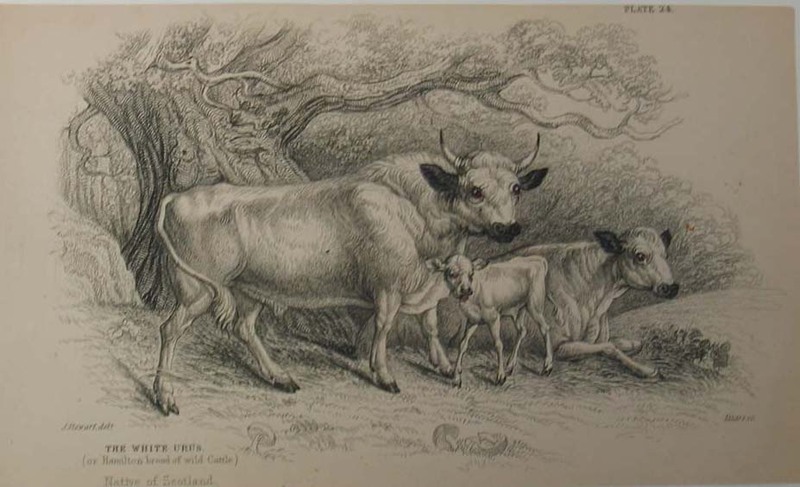 Without a doubt, I can't tell you just what T3's and traversions are, but it doesn't surprise me that the BON stood out as genetically unique cattle individuals among the criollo breeds. The study referenced is worth a look, as besides the technical nature of the genetic testing, it provides good discussion on the possible pathways of today's domestic cattle to the Americas. "Bridel is a cattle farm, 100% proud of being Colombian, located in the Cauca Valley. It is dedicated to rescue the breeding, and the strengthening of the Full-Blood Colombian cattle breed " Blanco Orejinegro " as genetic source, in order to explore its hybrid vigor and take advantage of its adaptation to our tropical environment. We cannot lose these 500 years of natural intervention. The “Blanco Orejinegro => BON ” is a cattle breed in danger of extinction, therefore it's conservation is our number one priority as a company. The advantages, characteristics and genetic resources of the BON breed are numerous and are usually under appreciated by the majority of the farms and the Colombian public due to the lack of understanding and marketing of the breed, since other foreign breeds are advertised and have higher commercial reach. Our Cattle farm was formed with special criteria of a company to guarantee its survival and maintenance throughout the years. The BON has low production costs, great genetic value, fertility, resistance to the environment, adaptability, quality marble meat, and the ability to be cross-bred with other cattle breeds." Bridel hasn't been wasting any time in ensuring the future of this endangered Colombian heritage breed. Care is taken to ensure the blood line remains pure, with BON Fullblood females always bred to BON Fullblood bulls. At the same time, Bridel is very conscious of the fact that the hardy nature and quality of the BON breed has much value to offer the commercial cattle farms of Colombia, and it is perhaps that value that will ensure the BON's continued existence. 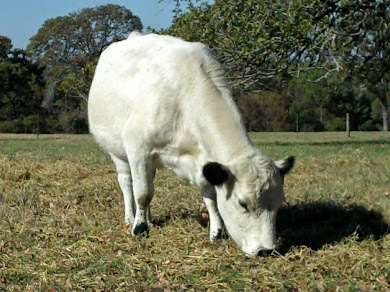 Bridel has an ongoing cross-breeding program with the Brahman, Holstein, and Wagyu breeds. Documenting the hybrid vigor of calves, the quality of the carcass, and the quality of the resulting replacement heifers is the right path to ensuring that future generations continue to recognize the value of the beautiful Blanco Orejinegro cattle breed. A visit to the Bridel web site is a must -- the Gallery of Photos is filled with beautiful scenery of the cattle and the Colombian countryside. After having a look you may well find yourself wishing for a Colombian vacation so you can visit this inspiring Cauca Valley cattle farm of green, mountainous pastures and quiet contentment. This past October the American Grassfed Association (AGA) held it's annual conference in Austin, Texas. The event was well attended with folks coming from many parts of the USA to participate in the many planned educational seminars. By far the most interesting, educational, and just plain entertaining guest speaker was the Scottish butcher, Stuart Minick -- and guess what, his finishing program for his organic grassfed beef includes oats and molasses added to the final 30 days of finish. Stuart Minick said the addition of oats and molasses to the finishing rations gives the resulting fat a smoother, tastier eating experience, and he indicated this method of finish is one of longstanding tradition. It was apparent that the American extremism of 100% grassfed was anathema to him. But is that American extremism of 100% or 99% (you see both purported) fact or fiction? Prior to attending the AGA annual conference, I would have staunchly defended all AGA grassfed producer/members as 100% forage -- now, I question the integrity of that statement, and left the conference more than mildly disillusioned and just plain irritated. I have for years now rigidly pursued a 100% forage based feeding program, and have made harsh breeding decisions based on animal performance under this regimen. 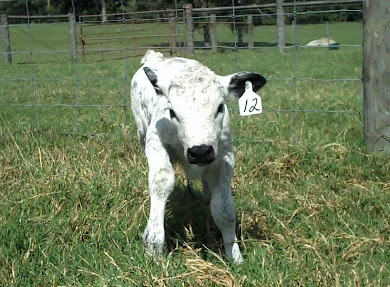 The result has given me a clear picture of what British White cattle genetic lines will best perform under this regimen, so I have no regrets. But, I am irritated. The USDA had a speaker at the conference to explain the newly created USDA grassfed standards. It was during this gentleman's presentation that I was enlightened as to what is actually taking place on many grassfed beef operations. One grassfed producer attending that presentation asked the USDA representative, "What about molasses tubs . . .?" The USDA rep. responded with the comment that he wasn't aware that was part of the feeding regimen, and the fellow assured him it was and that ". . .everybody fed tubs." I chimed in at that point, asking just what tubs he was feeding, as so far as I knew there were no molasses tubs on the market that were just that - plain molasses. I didn't get an answer, instead another grassfed producer spoke up and said she fed molasses tubs as well and that they were all natural and okay to feed. Okay, I thought, well that's interesting. Over the past few years I've heard on the grapevine that things like molasses, beet pulp, and whole cotton seed were okay to feed your grassfed herd -- but as it wasn't in the standards I stuck to 100% forage. The enlightening conversation in this meeting, to which no AGA employee or other AGA member objected, confirmed that grapevine information so far as feeding molasses. This past summer my pasture grasses seemed to be lacking some element of nutrition that always keeps my cows fat and happy and ready for winter, and a test of it in early summer showed a low brie(sp?). This lack of brie or sweetness to my grasses got me thinking about adding molasses to their diet this winter. I had spent a great deal of time a few years ago and more trying to locate a source for pure molasses -- which is what Stuart Minick feeds his beeves in the finish phase, pure molasses -- and I couldn't find a source beyond going straight to a sugar mill in Louisiana and getting it by the barrel to haul to the ranch. After this USDA meeting, I queried one of the heads of the AGA on just where I could get these acceptable molasses tubs, and I was given the name of a manufacturer to contact. I was thrilled for two reasons. One, that apparently the AGA was truly totally okay fine with the feeding of molasses (you can't find the feeding of molasses addressed anywhere on their web site); and Two, I now had a source of healthy molasses tubs for my girls when they needed an extra boost in the winter. Boy was I disappointed. The manufacturer did not have molasses tubs for AGA producers, had in fact worked with the organization in the past to develop one, but there had never been agreement reached on the content of the tubs. Strange indeed. Try as I might, I cannot find a single mention in the AGA's "Grass Ruminant Standards" dated December 2006, of the feeding of molasses tubs -- either pure, natural molasses, or molasses tubs with their typical added protein boosters of questionable source. Section 3.2.7 of the Standards does allow for "incidental supplementation" defined as ". . .less than one percent of the total energy consumed during the animal's lifetime." It's from this section of the Standards that we get the 99% grassfed minimum. This 1% is to allow for inadvertent exposure to a dreaded grain, and to provide a little help in maintaining cow health in times of adverse conditions. Quite laudable, but it doesn't provide for regular use of molasses tubs with added energy/protein sources, which is exactly what some members are providing their "grassfed" herds. The AGA has had a web site up and running for quite some time, has been an established organization for quite some time, has had a set of Standards for grassfed producers for quite some time. But, they have never implemented adherence to those standards with a resulting certification label as AGA Grassfed. The new USDA standards for grassfed meat production also provide a protocol, but do not provide audit of the producer with resulting certification -- it's a voluntary program -- which is obviously what the AGA's has been up to now. Perhaps if there'd been a certification process in place with the AGA, the USDA would have done likewise. This week we learn that ". . The American Grassfed Association said Wednesday its board has voted to start certifying grass-fed meat operations under a new industry-backed standard administered by Food Alliance (FA), owner one of the most comprehensive agricultural eco-labels in North America." That certainly makes for great press, but what is the back story on this new development? At the Austin conference the proposal to join up with Food Alliance was on the agenda; with Scott Exo, Executive Director of Food Alliance, being a primary speaker during the discussion session for this marriage between the AGA and Food Alliance. From the get go, the questions from the floor were negative on this proposal. The producers attending had done their homework and were quite concerned that the extensive and whole enterprise encompassing requirements to produce grassfed meats under Food Alliance would leave the small grassfed producer out in the cold. My read on the Food Alliance program was precisely the same. The question uppermost in my mind was why the AGA needed Food Alliance. The USDA provides for specialty certification for a wide variety of producer protocols, and why not work with them. 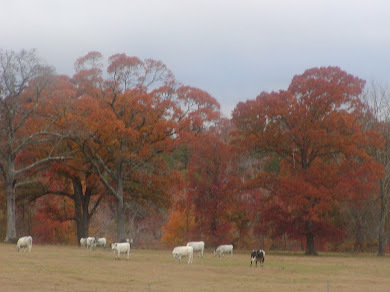 The newly minted USDA voluntary standards for grassfed production does not preclude the AGA or any other group from implementing a USDA certification program. I raised that question and was told that the bison people tried to do that and it cost them lots of money and they never got anywhere with it -- end of discussion. There were a variety of questions from the floor put to Scott Exo when he took the podium. The concerns were centered around the obvious need to have a big operation and deep pockets to qualify as a provider to Food Alliance; not only would there be the expected production protocols, but the producer would have to meet various other requirements -- labor issues being one area of a particularly rigorous nature to the small shop producer. Scott Exo apparently tired of these questions from these hard working farmers and actually 'bowed up' at his audience, an expression you hear in East Texas when somebody gets suddenly real defensive. Scott Exo made the statement along the lines of ". . .we've been courting you for while and we're taking you to the dance. . ." -- something like that, it was quite unprofessional, and his physical posture was one of somebody ready to have a fight. It certainly raised my eyebrows, and my suspicions of just what exactly was at stake here for Food Alliance and for the AGA. Obviously, Food Alliance will garner revenues from the large producers who can comply with all their protocols, but until the specifics of the financial arrangement between Food Alliance and the American Grassfed Association are fully disclosed, we can only speculate as to the root of his distress. Food Alliance now has the AGA at "the dance"; and AGA affiliated grassfed producers will have to perform the dance steps required by Food Alliance to ever get an AGA label for their product. The small producer whose funds have supported the AGA is potentially pretty much out of the picture. In the AGA press release much is made of the standards that will now be finally implemented via Food Alliance as superior to the USDA standards. For sure, the new USDA grassfed standards were hotly discussed at the Austin conference and used as a general prop to justify striking a deal with Food Alliance. The press release states ". . . AGA's grass-fed marketing claim standard is intended to exceed the requirements for the U.S. Department of Agriculture's grass-fed standard announced in October, which allows animals confined to feedlots, given antibiotics and growth hormones to still be labeled 'grass-fed' as long as they were fed a forage diet." Actually, the USDA does provide for Antibiotic Free and Growth Hormone Free labeling, just not within the new USDA grassfed standards, they see it as a separate issue. The important issues with the new USDA grassfed standards are potential feedlot confinement due to loophole type language in the standard, and their wholly voluntary nature. The American Grassfed Association could have implemented their own standards under a USDA certification program to address those concerns, but of course that cost those bison folks lots of money and they ended up with nothing. Let's get back to those molasses tubs. I still haven't found one that has nothing but forage based protein added to it -- I'm not even sure that's doable, but I'm not a chemist, or scientist, or whatever. But in the AGA press release we find again that "total forage" comment and one can't help but ponder where these molasses tubs fit with the program. The following statement is made, "The AGA standards, on the other hand, are primarily based on four precepts: total forage diet, no confinement, no antibiotics and no added hormones." Molasses isn't allowed under those basic precepts, although it is not a grain, and has long been a boon to meeting the energy requirements of cattle during stressful periods. In the good old days it was fairly easy in big sugar cane and beet growing areas to get real molasses to supplement cattle in times of additional energy needs. From various things I've read, it appears that adding molasses helps cattle to process high protein diets, like dairy quality alfalfa, more efficiently -- they don't poop out as much of that valuable and expensive protein. As I said before, I'm not a scientist, so don't quote me on that. Depending on what manufacturer is selling what, you can find all kinds of reasons and justifications for why you should buy their feed stuff -- which is precisely why I originally converted to an all grass/forage based cattle operation, and precisely why I wanted to find a source for pure unadulterated molasses. I don't care for all the gobbly gook ingredient lists and conflicting sales pitches on why something is good for my cows; and I haven't found a molasses tub yet that doesn't have something in it that I don't like. Are they feeding molasses tubs with things like feather meal in them? Sounds too much like eating a chicken, and I don't think my cows would knowingly eat a chicken. But without AGA guidance and oversight, how is the grassfed meat consumer to know whether the steak they have on the grill ate feathers? What exactly is in those molasses tubs that "everybody feeds"? Open and clear communication with members as to what is acceptable is sorely needed. So how could molasses fit in to a "total forage" certification program? Is it that open ended 1% of a cows total intake over their lifetime? Is that little item of much greater importance to the grassfed producer than I ever ever considered? At this point, I'm thinking that is one big loop hole that's been jumped on and in by the savvy grassfed meat producer. Calculating that 1% could become as complicated as doing my taxes. 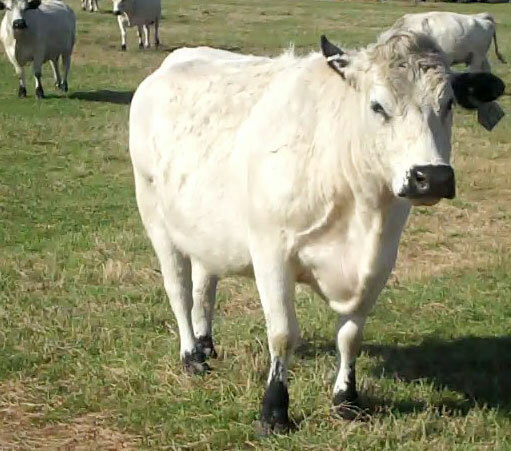 The British White cow has an amazingly long and productive breeding life. So what would be the lifetime 1% for my breed, versus 1% for a breed with a shorter life span? Of course, the average weight of your cow herd has to be taken into consideration when calculating this 1% as well. Generally, a cow is said to consume about 3% of it's body weight every day of it's life. The whole thing just gets really complicated, makes me want to get an excel spreadsheet up and running to work it all out -- but then, without a video camera, how is the grassfed producer supposed to know how much of a molasses tub was consumed by what cow or bull or maybe a pet llama running with the herd? Sounds ridiculous, and it is. Of course the grassfed beef steer has an average finite life. Generally he'll be ready for slaughter by at least 24 months old, and of course he'll be putting on weight every day and eating incrementally more every day. So maybe what the grassfed meat producer is doing to put that final finish fat on their steers is feeding every bit of that allowable 1% in the final 30 days! Like the Scottish butcher, Stuart Minick, does on his Aberdeen Angus beef operation in England. It makes grand sense to me, and at first thought sounds like it makes it a heckuva lot easier to calculate that allowable 1%. But no, I just gave it a brief thought, got out my calculator even, but darn if it's still somewhat complicated to figure out. Perhaps the Food Alliance protocols will have some hard and fast formula for determining this small, but apparently highly pertinent, loop hole in the AGA standards. Perhaps I'm wrong about this loop hole providing the opening for these molasses tubs AGA members are feeding; but if I am wrong, then the problems within the AGA are much worse than I concluded they were after attending the AGA conference in Austin, which in general was poorly organized. I would like to be able to say that AGA's partnership with Food Alliance is a great step for the members, but I don't beieve it is. ". . . Exo said those passing certification under the specific AGA grass-fed standards will be able to market products with both FA and the AGA's American Grass Fed seals." "[Producers] will be getting a twofer," he (Exo) said. Grassfed producers shouldn't have to get that "twofer". Large and small producers of grassfed meats could have been certified by the AGA itself; and those large producers desiring Food Alliance certification as well, certainly wouldn't have been prevented from garnering that quite respectable designation. The whole concept of grassfed has an inherent simplicity. The AGA's own comments highlight that simplicity, ". . .primarily based on four precepts: total forage diet, no confinement, no antibiotics and no added hormones." I can't find a single thing of great consumer importance that the FA designation provides that wouldn't have been provided by the AGA's own simple precepts: ". . .Total forage diet, no confinement, no antibiotics and no added hormones." The FA certification ". .addresses labor conditions, humane animal care, and environmental stewardship." The labor conditions are usually the owner's own sweat; humane animal care is intrinsic to growing grassfed meats; and the grassfed producer can't be a grassfed producer without environmental stewardship -- it's the life blood of their operation, next to superior feed efficient animals. The American Grassfed Association (AGA) said Wednesday its board has voted to start certifying grass-fed meat operations under a new industry-backed standard administered by Food Alliance, owner one of the most comprehensive agricultural eco-labels in North America. "We can now begin the process of developing the audit protocols that will allow our members to certify their farms and ranches as grassfed," AGA Beef Director Will Harris told Sustainable Food News. The AGA represents more than 300 grassfed livestock producers. FA certifies farms, ranches, food processors and distributors for sustainable agriculture certification, which addresses labor conditions, humane animal care, and environmental stewardship. Certified businesses can use the green, FA eco-label on its products to show off social and environmental responsibility. FA Executive Director Scott Exo told Sustainable Food News earlier that it could his group could start taking applications and undertaking inspections of producers wishing to be AGA-certified by May. AGA's grass-fed marketing claim standard is intended to exceed the requirements for the U.S. Department of Agriculture's grass-fed standard announced in October, which allows animals confined to feedlots, given antibiotics and growth hormones to still be labeled 'grass-fed' as long as they were fed a forage diet. The AGA standards, on the other hand, are primarily based on four precepts: total forage diet, no confinement, no antibiotics and no added hormones. The AGA grass-fed claim applies to ruminants only - cattle, sheep and eventually goats - not poultry or pork. And since producers seeking FA certification are already assessed against rigorous animal welfare standards including no hormones or non-therapeutic antibiotics, Exo said those passing certification under the specific AGA grass-fed standards will be able to market products with both FA and the AGA's American Grass Fed seals. "[Producers] will be getting a twofer," he said. Grass-fed meat producers have waited for years for the department to develop certification standards and procedures, like the organic certification and seal, to distinguish grass-fed animals from conventionally raised animals. And though the USDA did ban the use of antibiotics and growth hormones in its 'naturally raised' marketing claim standard it released in December, it still leaves out the issue of confinement. The comment period for the proposed voluntary standard for a naturally-raised marketing claim for livestock and meat was recently extended to March 3. Still, Exo said splitting sustainable agriculture practices into separate marketing claims can be especially frustrating for producers. "The problem with slicing things so thinly is that a producer has to put words all over packaging to get his marketing message across," he said. Exo said with both Food Alliance and AGA grass-fed certification producers are able to have a host of practices assessed to standards that consumers are calling for; all in one certification process and indicated by the FA and AGA seals. "That is the kind of simplification that the marketplace is looking for," he said. Please note - Our mailing address has changed! Excerpt: "They clung to my fur and pulled themselves up on wobbly legs, poked fingers in my eyes, investigated my ears, and gave me kisses on my nose. I loved everything about them and their touch — because your touch was now so infrequent — and I would’ve defended them with my life if need be." She, now your wife, is not a “dog person”…still I welcomed her into our home, tried to show her affection, and obeyed her. I was happy because you were happy. Then the human babies came along and I shared your excitement. I was fascinated by their pinkness, how they smelled, and I wanted to mother them, too. Only she and you worried that I might hurt them, and I spent most of my time banished to another room, or to a dog crate. Oh, how I wanted to love them, but I became a prisoner of love. As they began to grow, I became their friend. They clung to my fur and pulled themselves up on wobbly legs, poked fingers in my eyes, investigated my ears, and gave me kisses on my nose. I loved everything about them and their touch — because your touch was now so infrequent — and I would’ve defended them with my life if need be. I would sneak into their beds and listen to their worries and secret dreams, and together we waited for the sound of your car in the driveway. I was excited about the car ride until we arrived at the animal shelter. It smelled of dogs and cats, of fear, of hopelessness. You filled out the paperwork and said “I know you will find a good home for her.” They shrugged and gave you a pained look. They understand the realities facing a middle-aged dog, even one with “papers.” You had to pry your son’s fingers loose from my collar as he screamed, “No, Daddy! Please don’t let them take my dog!” And I worried for him, and what lessons you had just taught him about friendship and loyalty, about love and responsibility, and about respect for all life. They are as attentive to us here in the shelter as their busy schedules allow. They feed us, of course, but I lost my appetite days ago. When I realized I could not compete with the frolicking for attention of happy puppies, oblivious to their own fate, I retreated to a far corner and waited. I heard her footsteps as she came for me at the end of the day, and I padded along the aisle after her to a separate room. A blissfully quiet room. She placed me on the table and rubbed my ears, and told me not to worry. My heart pounded in anticipation of what was to come, but there was also a sense of relief. The prisoner of love had run out of days. As is my nature, I was more concerned about her. The burden which she bears weighs heavily on her, and I know that, the same way I knew your every mood. Perhaps because she understood my dogspeak, she said “I’m so sorry.” She hugged me, and hurriedly explained it was her job to make sure I went to a better place, where I wouldn’t be ignored or abused or abandoned, or have to fend for myself –a place of love and light so very different from this earthly place. And with my last bit of energy, I tried to convey to her with a thump of my tail that my “How could you?” was not directed at her. It was directed at you, My Beloved Master; I was thinking of you. I will think of you and wait for you forever. May everyone in your life continue to show you so much loyalty.